RUGHOOKER. 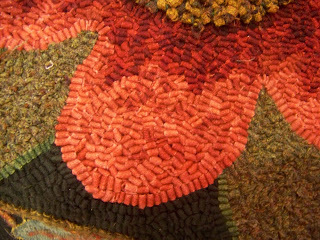 : Sauder Village Rug Show was Great - Again! My mother and I made our annual one day trip to Archbold, Ohio for the Sauder Village Rug Show. This was the 13th annual show, and I think I've been to at least 12 of them, maybe 13. The first time I went, Cindy Jones drove and I went with her and Dianne Klamik. The trip was about shopping for antiques as much as going to the rug show. Cindy used to drive 18 wheelers and I was definitely car sick by the time we finally reached Sauder. I don't remember being able to enjoy much of the rug show - however, this show was entirely different. We arrived before there was much of a crowd and were able to really see all of the rugs without bothering people with my mother's wheelchair. It wasn't long before I found my favorite rug. It was in the Celebrations portion of the show and it's called "Warrior Horses". 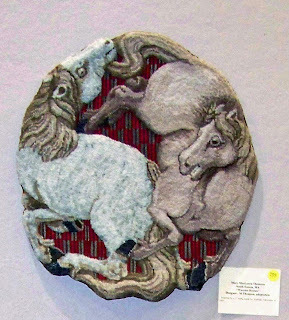 On my first trip through the show, I took a cursory look at the rugs and I thought the horses were given their multi-dimensional shape by needle felting or possibly hooving, but a closer look later on revealed the horses were hooked with raised #3 loops. They were hooked through a plaid fabric - some kind of stiff even weave that I've never seen before. so I won't repeat them here. I also told about my great chance meeting with June Mikoryak. She spent quite a bit of time telling me about the color plans in rugs hooked by her students. I really could see the difference between her students and other rugs, she really is a color expert. The secret on several of the rugs was just the right bit of spark, or poison. The poison color was one that you wouldn't normally include in the same color palette as the rest of the rug, usually a much brighter color. Those almost unseen additions added a depth and spark that set Mikoryak rugs apart from the other rugs - I'm afraid quite a few of the other rugs started looking quite dull to me. June also taught me about something I'd never heard of before called "antigodlin" or "antigogglin" hooking. It's done so the loops look like rice thrown randomly in a bowl. The photo is a close-up of a petal on a flower on a large bedrug hooked by Ann Bond. June Mikloryak said she studied the old rugs and the old books and realized the old hookers used this antigodlin technique - it certainly works well in Ann Bond's bedrug. June said the trick is to be sure your bottom hand is keeping the strip from twisting. She also said there might be spaces left between strips and you can go back and fill those in. I think I learned more from my chance meeting with June that I've learned in classes. I've always heard about using poison in color planning but have never seen such good examples, examples where the poison doesn't even show up unless you know what to look for - I think now I might have enough nerve to try sneaking in some poison myself. I didn't know it was called Poison. But I discovered it by accident in my own rugs - that adding a weird strip of color (like along the edge of a leaf) makes my rugs pop. I guess I've been adding Poison to my rugs without knowing it. Yikes. Couldn't we call it something different? Like Surprise Candy?